The Foreign ministers of BRICS countries fueling global economic growth have discussed strengthening ties within the bloc and rallying emerging economies to play a greater role in world affairs, economic and political. The five Foreign Ministers have met on the sidelines of the UN General Assembly on Thursday. “The decisions to establish the New Development Bank and the Contingent Reserve Arrangement taken at the Summit raise BRICS cooperation to a fundamentally new level. The Ministers reiterated the need to promptly convene a meeting to advance intra-BRICS economic, trade and investment cooperation,” said a statement emailed by the Russian Foreign Ministry on Friday. The BRICS Bank is hailed by experts as the first step towards reshaping the Western-dominated international financial system. 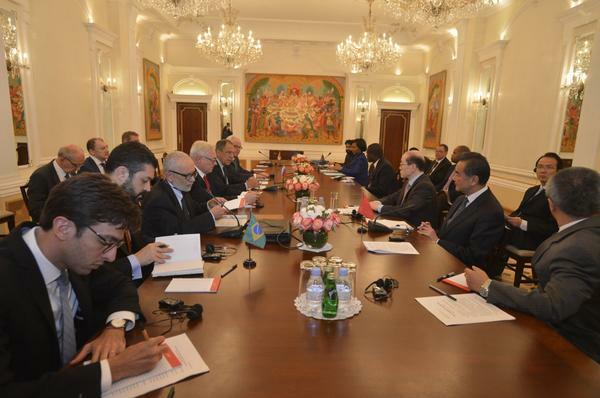 The meet also “reaffirmed BRICS members’ commitment to safeguarding a just and fair international order”. “They also reaffirmed the need for a comprehensive reform of the UN, including the Security Council with a view to making it more representative, effective and efficient, so that it can adequately respond to global challenges,” said the statement. Brazilian President Dilma Rousseff, in her opening address at the UNGA, earlier this week, criticized the UN Security Council for its failure to implement reforms. BRICS on Thursday also lauded “the role played by Egypt in the cessation of hostilities” in Gaza earlier this year. “The BRICS member states supported Egypt and Norway’s plans to hold an international donor conference on the reconstruction of the Gaza Strip in Cairo this October. The Ministers underlined that the implementation of such initiatives should be backed by prompt steps towards lifting the blockade on Gaza and promoting Palestinian reconciliation in order to restore administrative unity to the Palestinian territories on the basis of the political platform of the PLO and the Arab Peace Initiative,” said the statement. The five countries that consist BRICS boast nearly half the world’s population and account for about 20 per cent of global GDP, giving the group considerable heft. The Ukraine crisis was also discussed by the five Foreign Ministers even as Moscow battles new rounds of sanctions imposed by the US and the EU for its alleged backing of separatists in eastern Ukraine. “The Ministers underscored the importance of ensuring peace and stability in Ukraine. They welcomed the Protocol on the results of consultations of the Trilateral Contact Group, signed on September 4, 2014, and the Memorandum on the implementation of the said Protocol signed on September 20, 2014, and expressed their hope that the provisions of these documents shall be complied with,” said the statement. Chinese Foreign Minister Wang Yi on Thursday said the 6th BRICS summit in July this year in Brazil, injected new vitality to the bloc of leading emerging economies. “BRICS countries should conduct regular coordination on major international political and security affairs and put forward political settlement proposals to international hotspot issues, so as to promote the influence of BRICS countries,” he said. BRICS have also said they would join efforts for “supporting the prompt establishment of the interim African Capacity for Immediate Response to Crises (ACIRC) and the subsequent establishment of the African Stand-by Force”. “The main role in tackling African conflicts should be played by Africans themselves with active support from the UN and the international community, through the African Union and its Peace and Security Council,” said the statement. South African President Jacob Zuma has pressed for the mobilisation of resources for the African Capacity for Immediate Crisis (ACIRC) at the African Union Summit in Malabo, Equatorial Guinea, even as terror and sectarian violence roils across the continent. South Africa has put its political weight behind having a single influential continental force that will respond to conflict and crises in the continent. Russia will host the 7th BRICS Summit in 2015 in the city of Ufa.